Early benchmarks for the Tegra K1 processor from NVIDIA are hitting the web this week, apparently running on a Lenovo ThinkVision 28 4K smart display which features the Android OS. The thing is, NVIDIA would state that these are just preliminary benchmarks, as the processor has unlikely been optimized for such testing, and these numbers shouldn’t be taken to heart quite yet. The new SoC is still unavailable to the public, so NVIDIA still has time to make these already-impressive numbers go up from here. 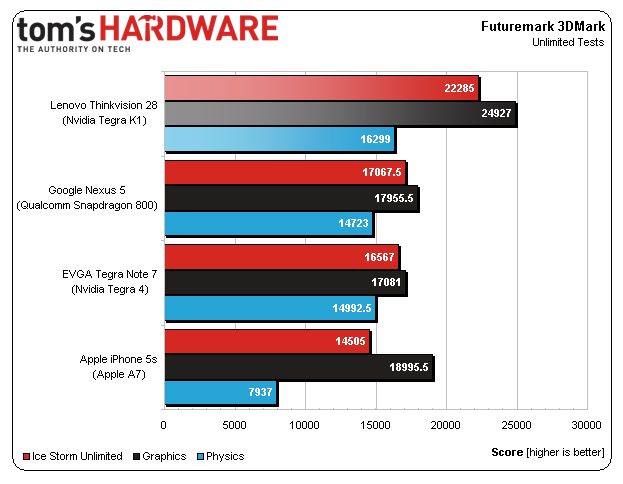 As one would expect, the benchmarks clearly beat out all of last year’s top performing chips, such as Qualcomm’s Snapdragon 800, Apple’s A7, and NVIDIA’s past Tegra 4. 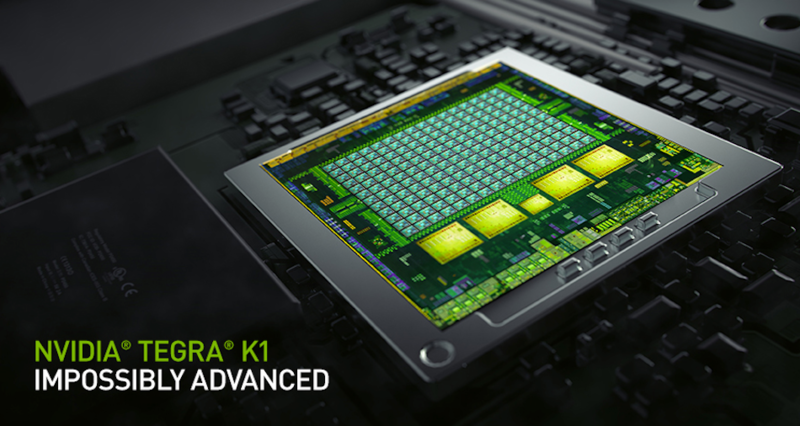 With the Tegra K1, NVIDIA is moving towards bringing console-like graphics to mobile processors, and if the new benchmarks are any indicator, they are moving towards the right direction. Tom’s Hardware posted up a few benchmarks on their site, focusing primarily on the processor’s 192-core Kepler GPU. As stated by the site, the tests either don’t recognize the frequency at which the Tegra K1 operates at or Lenovo’s device is placing a 15% lower operating ceiling on the application processor than which it is capable of running. Regardless of which it is, it is still good to see that it performs just fine with said limitations. 3DMark is a multi-platform graphics benchmark that contains both graphics and physics tests, which is shown above. This versions runs at an off-screen resolution of 720p, so focus is solely on the processors, and the results won’t be affected by the device’s display. This would be your basic chip-to-chip comparison sheet. GFXBench (shown below), is another multi-platform which renders a scene that features a lot of different effects, as well as additive lighting and physics. The off-screen results show performance for a display resolution of 1920 x 1080, while the on-screen results show for the device’s native display resolution. 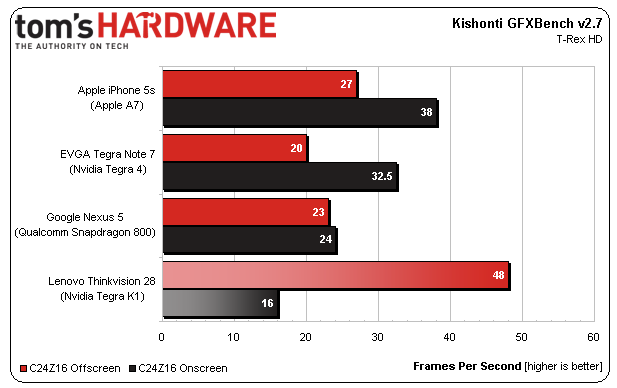 Since the Lenovo device is running a UHD display, that is why you see such a dip in performance (the black bar). Again, since the chip has yet to be optimized for these benchmarks, we wouldn’t rely on their results too heavily quite yet. This is just a nice way to see what we should possibly expect from the processor. What we have yet to see are benchmarks of actually released devices, featuring new chips from all makers, such as Qualcomm’s Snapdragon 805, as well as new silicon from Intel going up against the Tegra K1. From the end-user point of view, a lot of these numbers won’t necessarily translate to real life scenarios, but your overall experience will be greatly affected. Will the extra power consume battery quicker? Will your device overheat? Will games and apps lag? All of those questions won’t be answered until we see 2014 devices hit the market running this next generation of chips. And for that, we are excited for their release.